Typically, logging companies don't advertise in the local paper or the back of the phone book. It can be tough to track them down. Many times, loggers will work with one sawmill and go from job to job harvesting timber for a particular sawmill. Therefore they don't need to advertise. There are, however, a few ways to find these loggers. Contact timber buyers and foresters in your area; they work with many loggers and can give you a list of logging companies to contact. Your state's natural resources department and your local county farm agencies are also great sources. Finally, and most importantly, network. Talk to people like farmers and ranchers, local business owners and heavy equipment mechanics. Tree Services are fairly easy to find. They often advertise their services in the local newspaper or the back of the phone book. It can be a fantastic source for some very good logs at a low price. Tree service owners will be more than happy to sell you logs; it means less material that they have to dispose of. Often they will give you the logs just to get them out of the way. 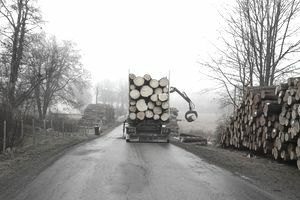 You need to be aware of your costs when offering to purchase logs from tree services. Yard trees are often loaded with blade destroying metal, so figure extra blades in your costs. Transporting the logs to your sawmill can be a major expense. It is best to have a portable sawmill that you can bring to the logs instead of transporting the logs to your yard. Big sawmill operations can be a great source for logs. Many sawmills specialize in a certain type of product, such as grade lumber or pallet lumber. They will have logs that are not appropriate for the type of lumber they produce and will be more than willing to sell them to you. Be prepared to purchase truckload quantities of logs. Most of the time the logs will be shipped directly from the woods to your yard. There are two different types of reclaimed timber operation: building demolition and salvage operations and sunken log recovery companies. They are known as "swamp loggers" or "river loggers." The reclaimed lumber industry isn't nearly as big as the conventional logging industry. It makes reclaimed timber companies a little more spread out, so you may have to work with companies that are 100 to 500 miles away. The best place to start is the web. Start by doing a web search for reclaimed lumber in your state. Another place to look is Woodplanet. Many reclaimed lumber companies list what timber they have available there, making it an excellent resource. It works if you plan to purchase reclaimed timbers that have been harvested. There are, however, many ways to obtain reclaimed lumber without purchasing it.